Focusing on assessment through therapist-driven protocols, this valuable tool provides an overview of the assessment process and fundamentals needed for success. 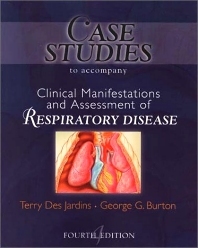 It offers discussion of the top five treatment protocols: oxygen, hyperinflation , bronchial hygiene and bronchodilator therapies, as well as mechanical ventilation. Using a case study approach, students learn to manage an entire case from beginning to end. Each time they assess the patient, they use the SOAP format: Subjective, Objective, Assessment, and Plan reasoning, giving them practice in documenting history and developing care plans.